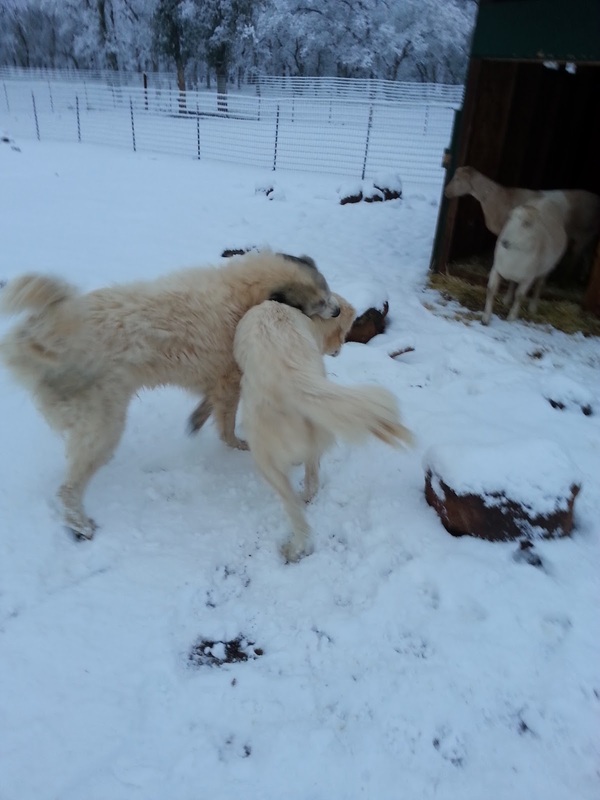 This was Yarrow half of my livestock guardian team when she was just about 12 weeks old. Stink'n cute wasn't she? This is her a few years ago. Still cute but more like stylish. And to this day she is pretty much the same beautiful well behaved (except when she is yelling at Sherman) Mama dog I love. Well until about a two weeks ago . I started noting changes in her behavior and I was a bit worried about her. Yarrow has had seasonal allergies for pretty much most of her 6 years. She , like myself, tend to get weepy eyes, nose and ear issue when the Buck Bush aka Scrub Oak starts blooming.She then gets cranky with Sherman "Dude back off you are breathing my air." Of course I am much more well behaved. The standard treatment which Doc Lydon brewed up for me to give wasn't working. So I realized that maybe there was something else brewing. She got crankier and pretty much continued on as always. Taking her walk with me each morning and holding up her end of the working team at night. This breed is tough. They are pretty stoic. I usually say regarding this trait "You could put a stake through their heart and they would look at you with tail wagging." In other words when you job is to deal with the bad guys nightly never let them know you are down. A week ago Tuesday I noted Yarrow was leaving some kibble in her dish . Each night a bit more and on our walks even though she pressed on her spark was missing and she hung closer to me than usual. And she got crankier with Sherman. Poor boy he didn't know quite what to do. I tried to console him with "Buddy it is gonna be ok, giver her space." Come Saturday of last week most of the meal was left. She was letting Sherman do the lions share of the night job with the bad guys. She started drooling (Yarrow isn't a drooling Pyrenees) and pretty much was flat. I decided then to take her into a local clinic that had Sunday hours and called to leave a message I would be at their door the next day. After accessing her symptoms no vomiting or diarrhea and temperature within normal limits I had the vet run her CBC and chemistries . All of which came back pretty disgustingly normal. So I took her home after an injection of Cerenia , a great anti nausea drug and a potential treatment plan in hand. The next morning she was not so nauseated and didn't get green when offered a bit of cookie and when she looked at the water bucket. We had our walk still abbreviated but she navigated a bit easier. I then took the lab results and zipped up the mountain to see Doc and decide what we were going to do with this. There were multiple symptoms and possibilities so a plan was decided on what could be done that would cover the two strongest possibilities. Yarrow has been on a rice and chicken diet since Sunday when I got her home . She was given the Cerenia once daily through Wednesday and has tolerated the withdrawal of it well. To date no return of extreme nausea symptoms. Doc started her on Doxycycline 400 mg once a day for 21 days. A nice steady moderate dosing that should knock the stuffing out of the potential offenders. I am seeing gradual improvement daily and she went back to work Tuesday. She is no longer being cranky with Sherman . And she will have her first meal with her usual kibbles making up 75% and 25% comprised of rice and chicken. I was waiting to post this until I felt we were in a less guarded place with her. These two Pyrenees are the reason I sleep at night. I love my two hard working dogs to bits and the thought of losing either of them is cause for concern. So now a week out from a time when it was possible the ending may have not been so positive I wanted to share the story. It's easy to see your dogs are an integral part of your life. Let's hope she's over this blip in her health and all further updates are full of good news. Do keep updating us will you, please? So glad she is improving. Hope things keep going in a positive direction. Could it have been poison. We have lost more than one animal to various poisons over the years. Thanks Mama Pea. She is coming along still eating and more her old self daily.Finished first week of three week course of meds. Know enough to not start celebrating just yet though. Glad to meet you gld. Sorry to hear that you have experienced losing an animal to poison. Not pretty for anyone to be sure. I am confident that it is thankfully not the case here. One of the bonuses of living in the middle of nowhere is less exposure to a lot of situations. I found myself holding my breath until the end. Thank goodness she is feeling better! What a scare!!! Having a team like that protecting your darling goats is worth its weight in gold. Whew. Susan you crack me up. I didn't realize that I had related a cliff hanger. If I ever write professionally I want you to be my agent! But in a serious moment I will say that my dogs all of them are a huge part of my life especially now. Without hanging out the dirty laundry as this chronic cancer journey progresses they are my best company. Hope your weather is behaving itself today. Good to hear she is doing better. Hope she eats more and feels stronger every day. Thanks for the well wishes. I shared them with Yarrow as she was scarfing down a large dish of brown rice , about 1/4 cup of her regular kibble , chicken meat and an egg from our hens. I believe she took your support to heart.